As a child of the earth I am thankful for Native American sisters and brothers protecting our common Mother from the Dakota Access Pipeline, and I am proud to stand with Standing Rock. The following letter was sent by the Oklahoma United Methodist Environmental Coalition in support for the Standing Rock Sioux Tribe. The Oklahoma United Methodist Church’s Environmental Coalition stands in solidarity and support of the Standing Rock Sioux Tribe and other communities in their opposition to the construction of the Dakota Access Pipeline. The environmental threat to land, water, endangered species—indeed, to the entire planet by encouraging the burning of more fossil fuel that leads to climate change—is real. 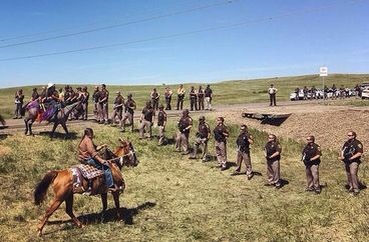 The disrespect to indigenous people by not consulting with them before their land is violated is abhorrent. “We are aware that the current utilization of energy resources threatens this creation at its very foundation…We strongly advocate for the priority of the development of renewable energies…Rampant industrialization and the corresponding increase in the use of fossil fuels have led to a buildup of pollutants in the earth’s atmosphere…We therefore support efforts of all governments to require mandatory reductions in greenhouse gas emissions and call on individuals, congregations, businesses, industries and communities to reduce their emissions. Indigenous peoples have a deep and profound understanding of Earth’s systems, of how nature works and it is long overdue that we listen to them. We stand strong with the people of the Standing Rock Sioux community as they and other native peoples lead this nation and the world toward a more sustainable Earth community. We urge the Corps of Engineers to listen to them as well.